How many miles can you ride your bike? 25? 45? 76? 100? 150? 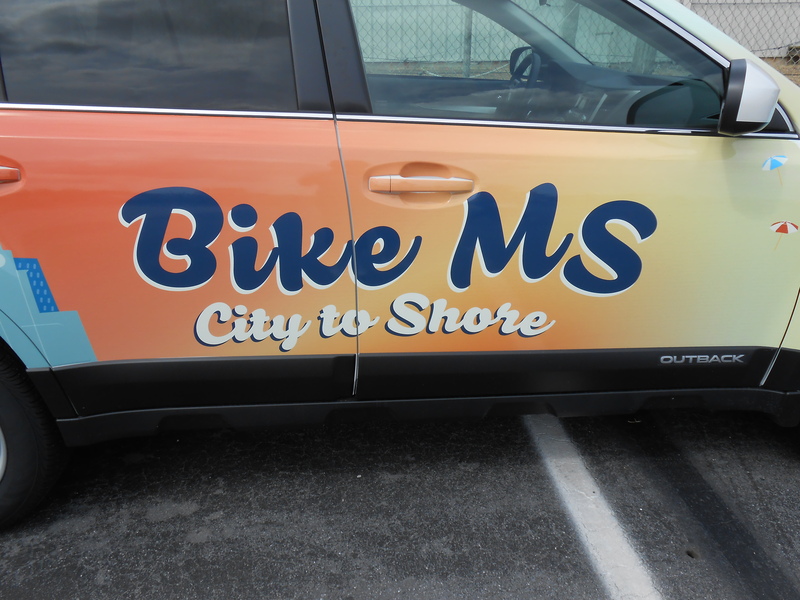 Participants in the 2012 Bike MS City to Shore had their choice of routes and miles, but whichever route they chose, they rode with enthusiasm. 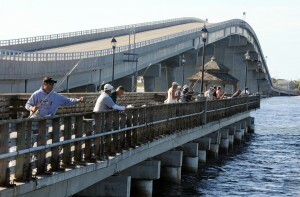 After pedaling on local back roads through the beautiful countryside of Southern New Jersey with its charming small towns, woodsy areas, Pine Barrens, blueberry fields, bird-filled marshes, the riders finally reached the last two daunting, muscle-challenging hills: the Delores Cooper Bridge and the Ocean City-Longport Bridge. 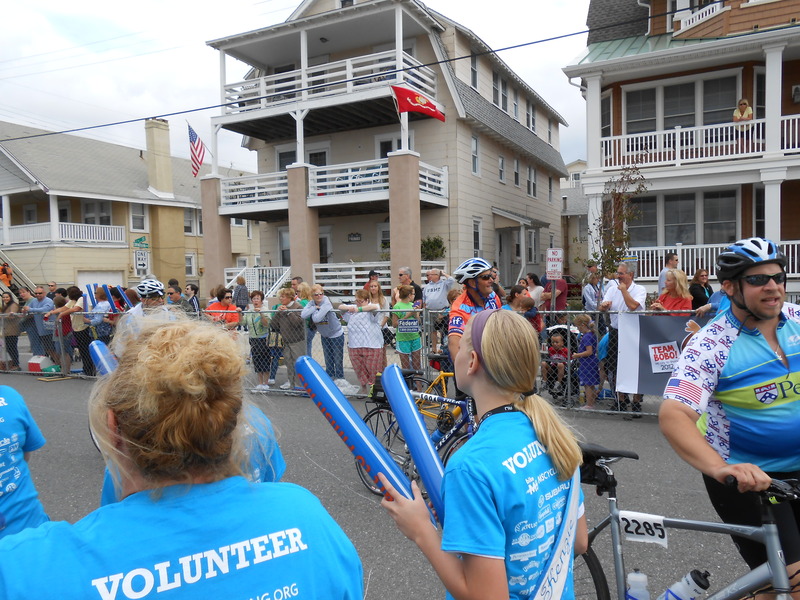 After that, it was an easy ride to the finish line at Fifth Street in Ocean City, NJ. Over 7000 riders (hearsay says 7,700), took on the MS challenge and raised a whopping $4,632,383.29 towards the event goal of $5,200,000.00. Funds will continue to come in over the next few weeks. Many corporations (Merck, Pfizer, Teva, Novacare, Bank of America, Johnson and Johnson, Campbells V-8, UPHS/PENN, and others), places of worship, organizations, cycling clubs, schools, and individuals participated in this bike-a-thon. 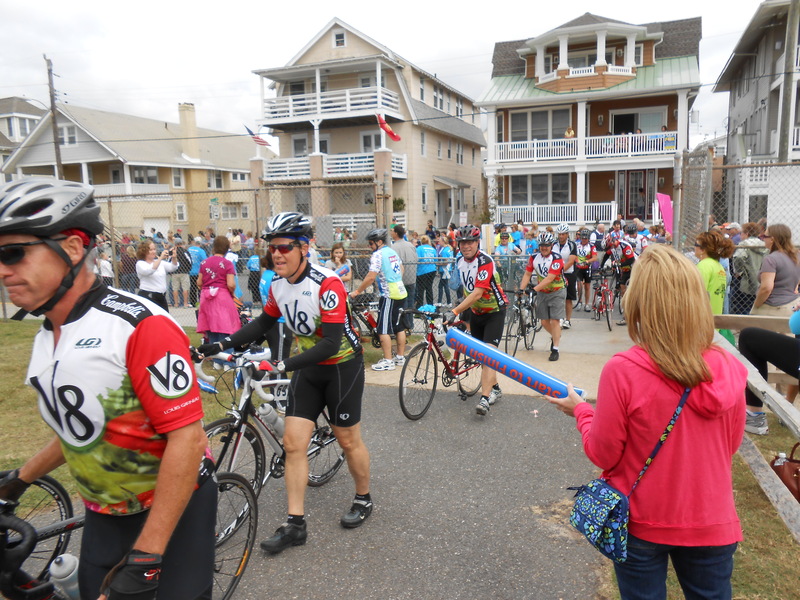 An enthusiastic crowd gathered at the Fifth Street finish line to welcome the tired bikers and make noise with their bam-bams. Campbell’s V-8 bikers walked their bikes to the staging area after completing the race. 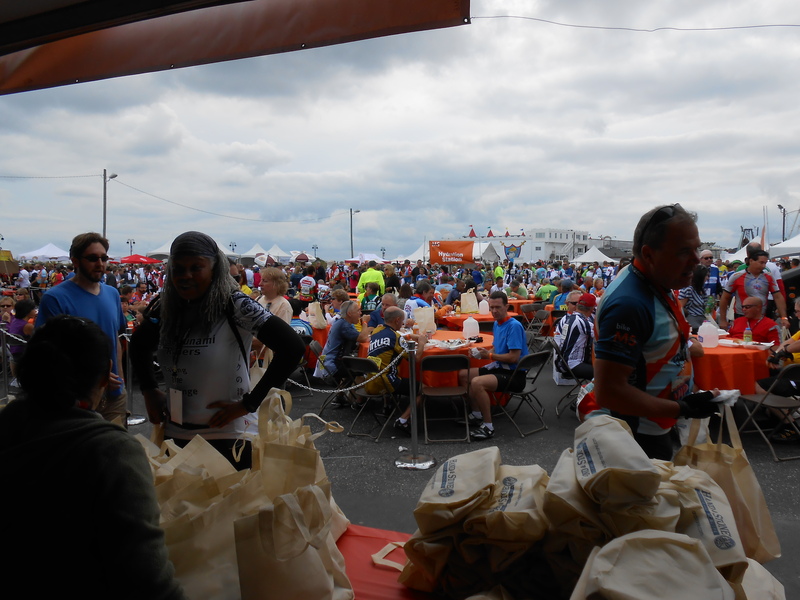 I must admit that I did not ride 75 miles or even 10 miles, but I did volunteer in the VIP Chicken Tent all day along with other Krewe du Kroey family members. 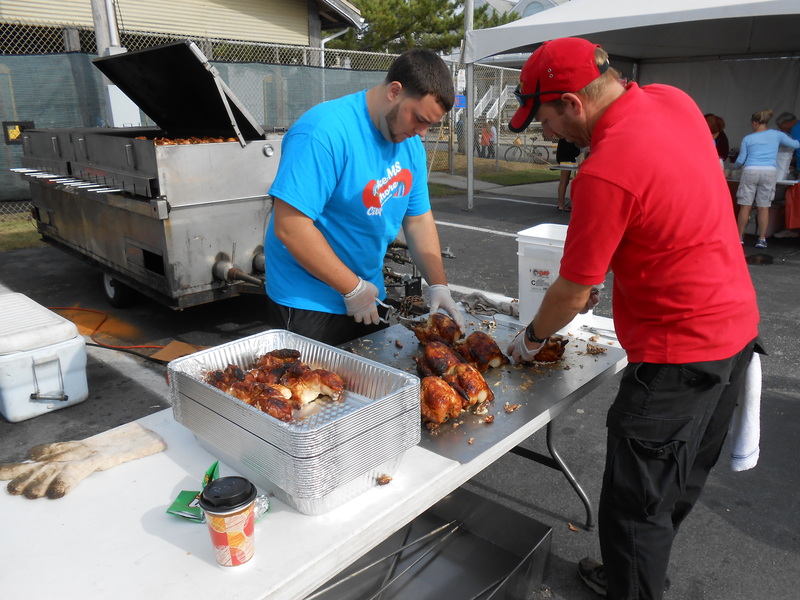 A team of volunteers prepped 1300 bbq chicken dinners for VIP riders (riders who have raised over $1000 each). The highest individual fundraiser, rider Phillip Cooper, reportedly raised $23,041, with Andrea Rosenthal following close behind with $20.003. Virtual participants joined in, too. Jack Beiter raised $14,760 and Beth Malikowski raised $3,490. The Krewe du Kroey volunteers for this event every year. Some family members have volunteered for this event for more than ten years. Younger members of the family join right in and work along side the adults. 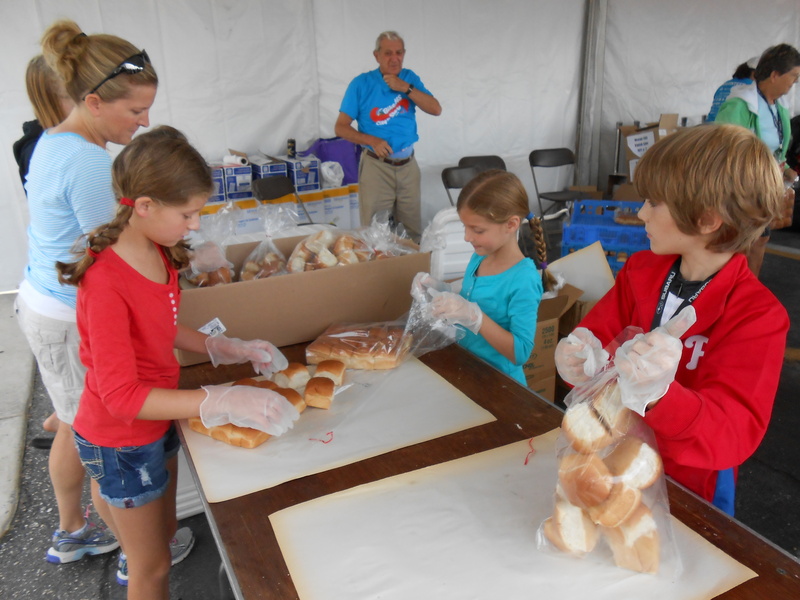 Maddie (10), MiMi (7), and friend separated and repackaged dinner rolls in preparation for the food line. Mom supervised. 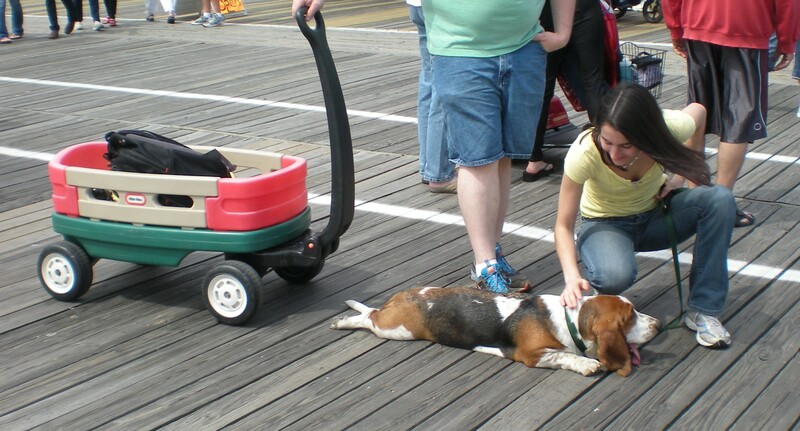 Maddie was our most enthusiastic supporter of the bikers. Later, as she placed cups of cole slaw on the chicken platters, she offered continuous encouragement to riders. “Great job riders.” “Thanks for riding.” “Congratulations, riders, you finished a great race.” What a treat to work with her. 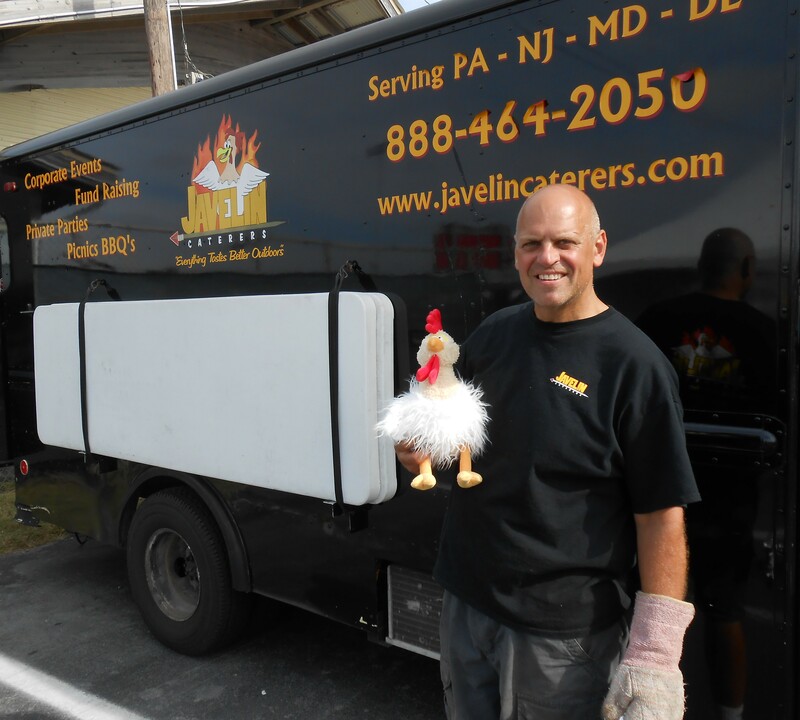 The chef’s assistants cut chickens. 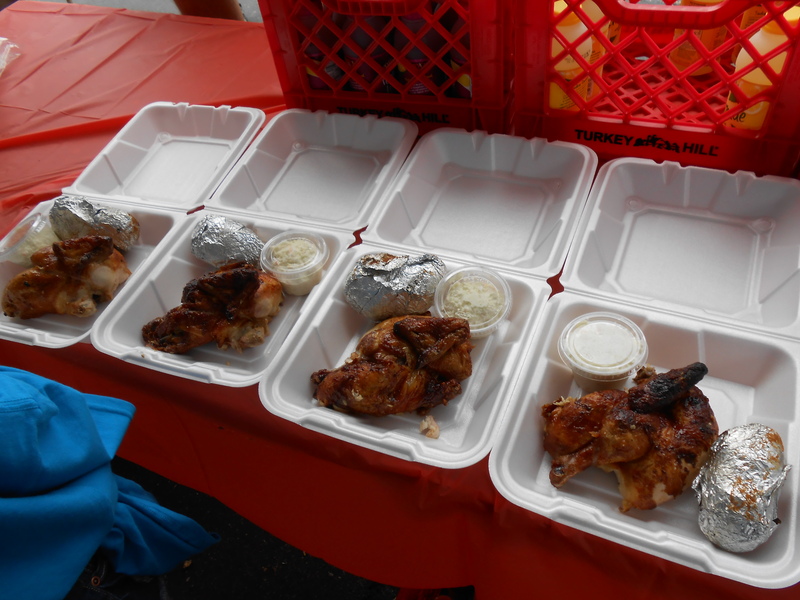 Volunteers plated up the chicken dinners for the hungry VIP riders. Our friend and neighbor, Roy, rested a few minutes before eating his dinner. 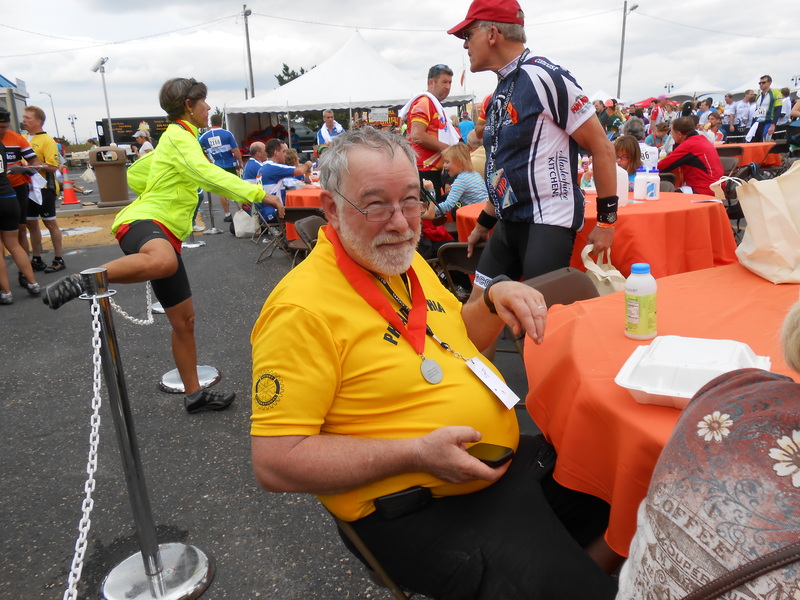 Roy rides every year in this even for his wife, Sue, who has MS. Most riders have a very personal attachment to a person with MS and ride in their honor. 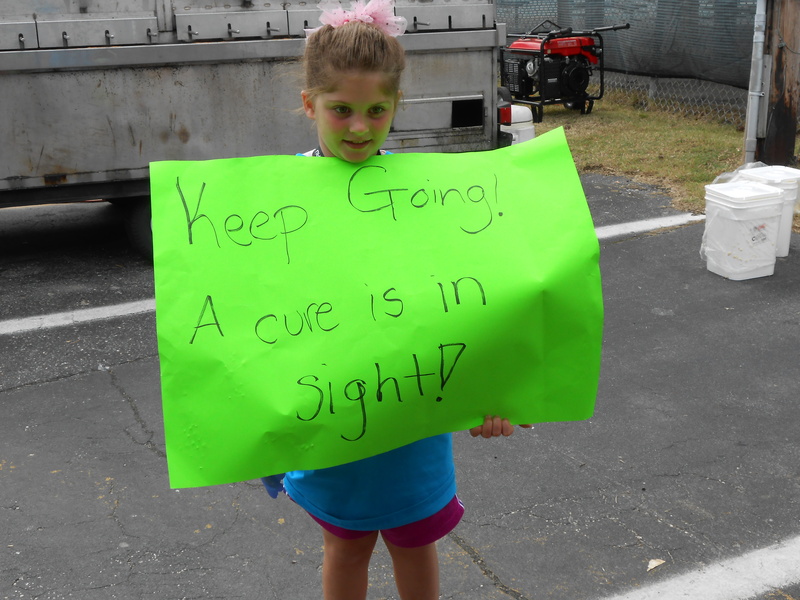 Brianna enthusiastically marched around the VIP dining area carrying a sign with the positive news that a cure for MS is in sight. 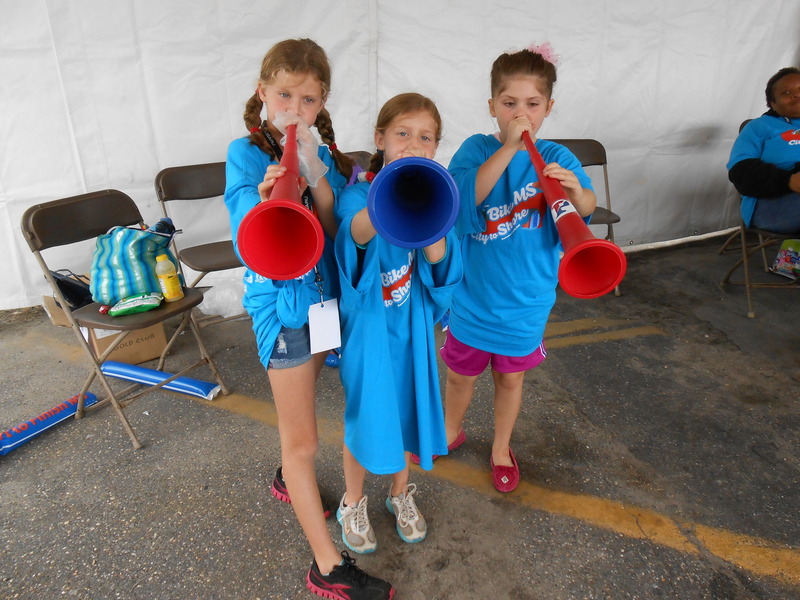 Children can learn the value and positive benefits of volunteering at an early age. Thanks to the 7,700 riders, 1000+ volunteers, vendors, and donors who supported this worthy cause. With such commitment and promise, MS doesn’t have a chance. Check this out: Eiko, an 85-year-old Asian woman wearing a dress and heels and carrying a purse, rides in the MS Bike City to Shore! Volunteers and riders all have fun in this event. 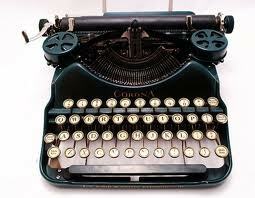 What’s been your greatest physical challenge? Do you know anyone who has MS? What’s their story?